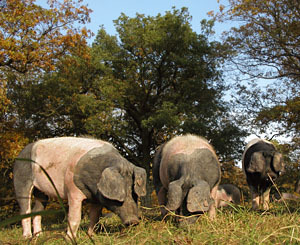 Pigs raised under oak and beech trees produce the best ham. But maybe you want to try the lab ‘Petri dish pork’ instead??? LONDON — Call it pork in a Petri dish — a technique to turn pig stem cells into strips of meat that scientists say could one day offer a green alternative to raising livestock, help alleviate world hunger, and save some pigs their bacon. Dutch scientists have been growing pork in the laboratory since 2006, and while they admit they haven’t gotten the texture quite right or even tasted the engineered meat, they say the technology promises to have widespread implications for our food supply. “If we took the stem cells from one pig and multiplied it by a factor of a million, we would need one million fewer pigs to get the same amount of meat,” said Mark Post, a biologist at Maastricht University involved in the In-vitro Meat Consortium, a network of publicly funded Dutch research institutions that is carrying out the experiments. Post describes the texture of the meat as sort of like scallop, firm but a little squishy and moist. That’s because the lab meat has less protein content than conventional meat. Several other groups in the U.S., Scandinavia and Japan are also researching ways to make meat in the laboratory, but the Dutch project is the most advanced, said Jason Matheny, who has studied alternatives to conventional meat at the Johns Hopkins Bloomberg School of Public Health in Baltimore and is not involved in the Dutch research. In the U.S., similar research was funded by NASA, which hoped astronauts would be able to grow their own meat in space. But after growing disappointingly thin sheets of tissue, NASA gave up. To make pork in the lab, Post and colleagues isolate stem cells from pigs’ muscle cells. They then put those cells into a nutrient-based soup that helps the cells replicate to the desired number. So far the scientists have only succeeded in creating strips of meat about 1 centimeter (a half inch) long; to make a small pork chop, Post estimates it would take about 30 days of cell replication in the lab.